It is practically impossible to break a dry spaghetti noodle into exactly two pieces. Try it—odds are good that you'll end up with three or even four fragments. Even Richard Feynman spent time noodling over the conundrum. Inventor Danny Hillis wrote in a 1994 Feynman biography that he and the famed physicist spent “hours coming up with crazy theories. We ended up with broken spaghetti all over the kitchen and no real good theory about why spaghetti breaks in three.” French physicists solved the answer of why in 2005, earning themselves an Ig Nobel prize for describing the “snap-back” wave that fractures the spaghetti into multiple pieces. But the story doesn't end there; in 2015, two MIT students wanted to see if it really was possible to break spaghetti into exactly two pieces. They eventually built a mechanical device to reliably bend and twist hundreds of spaghetti noodles. The trick? If you twist spaghetti nearly 360 degrees, then slowly bend it, it will snap exactly in two. The work was reinforced by a mathematical model developed by another MIT student and the French scientists who developed the original spaghetti theory. The model found that as the spaghetti unwinds from the twist, it creates a twist wave that travels faster than the snap-back wave, dissipating extra energy. Scientists have, for the first time, traced a neutrino back to its source. In July, physicists working with data taken at the IceCube Neutrino Observatory in Antarctica reported in Science that they had detected a single neutrino and figured out exactly where it came from: a blazar, a giant galaxy with a black hole at its core, 4 billion light-years away. Physicists have been hoping to find the sources of neutrinos for decades, because they’re related to cosmic rays, with one key difference. Cosmic rays, being charged particles, change their trajectory as they zip through the galaxy at insanely high energies. (The highest-energy cosmic-ray particle ever recorded was two million times as energetic as the protons accelerated at the Large Hadron Collider.) Neutrinos are essentially inert, so they travel in a straight line. That means when we detect one, we can theoretically trace it back to where it came from. That happened for the first time when a single neutrino hit IceCube in September 2017 from somewhere in the direction of Orion. Researchers trained their observatories around the constellation to find a more precise source, and the Fermi Gamma-Ray Space Telescope delivered: It detected a jump in energy coming from a blazar known as TXS 0506+056. 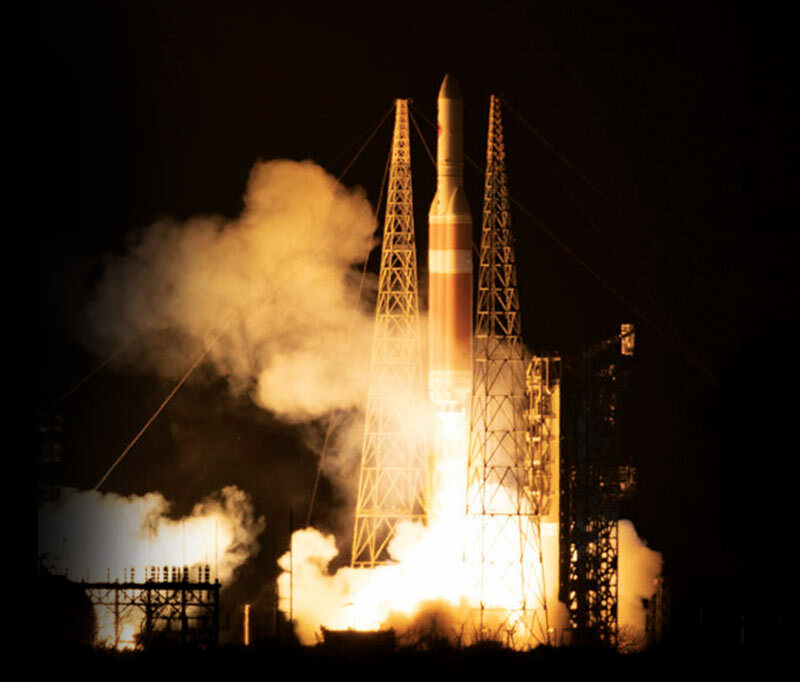 The Parker Solar Probe successfully launched August 12 on a Delta IV Heavy rocket. It will spend the next seven years gracefully pirouetting closer and closer to the Sun, until its closest approach, under 9 solar radii (about 6.2 million km) from the photosphere, the closest any human-made probe has ever been to our nearest star. This places it solidly within the corona, or outer atmosphere, of the Sun. Scientists hope to learn more about how and why the corona is so hot (about 1 million kelvin) compared to the Sun’s surface (about 5800 K). They’re also hoping to study in depth the Sun’s magnetic field, which creates and accelerates the solar wind. The probe is named for astrophysicist Eugene Parker, who coined the term “solar wind.” It’s also the first NASA spacecraft named after a living person. Learn more about Parker at: https://www.nasa.gov/content/goddard/parker-solar-probe.